Beautiful beaches and luxurious resort hotels in Los Cabos line the peninsula’s southern tip from San José del Cabo to Cabo San Lucas, catering to sun lovers, party animals, surfers and golfers. These are just south of the Sierra de la Laguna Biosphere Reserve, a nature paradise for experienced hikers, Baja’s most tourist developed area begins. 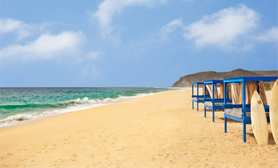 Todos Santos is a quieter, more bohemian-style town with art galleries, chic boutiques, and some of the most beautiful beaches of the entire peninsula.